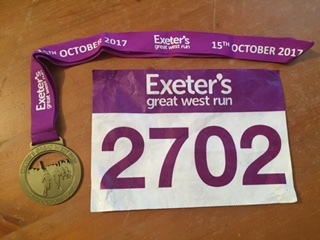 On Sunday 15th October 2017 I ran the Great West Run, a half marathon through the streets of Exeter. 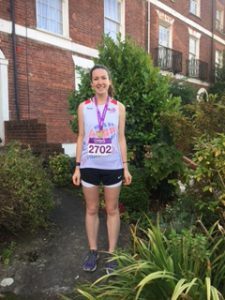 I had a great time and managed to achieve a new personal best of 1:52:59 so while I am still reeling over this achievement I thought I’d write a quick review! I signed up to the Great West Run in August when it cost the full price of £36 (early bird prices are already available for 2018) and I received a lot of information in the run up to the event. Thankfully, I didn’t need a shuttle bus ticket but those were also available to take you from the city centre to Exeter Arena. I think all races are expensive but I think this might be one of the cheaper half marathon options (please tell me if you know of cheaper races in the South West!). I received my bib number about a week or two before the race so everything was under control and I was feeling prepared! See for yourself! Symbolised according to elevation, this map shows the low-lying roads close to the River Exe in pale yellow and higher ground (university climb) in dark purple. Click on the mile markers to find out more. The route was different this year than last and having chatted to friends that have also ran in both 2016 and 2017, I have heard mixed opinions. As you can see from the map above, the race starts and finishes in Exeter Arena, home of Exeter Harriers, where Jo Pavey started her running career. With speedy flat roads through the city centre, challenging uphills and a testing out and back section, I think the Great West Run really does have it all. There are plenty of supporters there to cheer you on but with the start/end being out of the city centre, you might need a bike if you want to cheer at multiple points. I enjoyed ending on a downhill and the out & back section wasn’t as bad as I anticipated as I could watch those right at the front speeding past me on the other side of the road. You also finish by doing a lap of the track so you can feel like the professional athlete that you truly are! Let’s go! 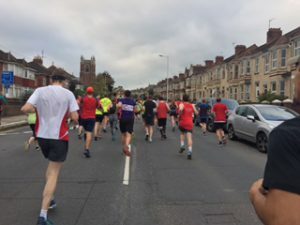 Running up Pinhoe Road. Now to the good stuff. On finishing the race you are awarded a medal, t-shirt and a goodie bag. The t-shirt this year was white with purple writing, definitely one of my new favourites and the medal is now proudly hanging up in my bedroom. I have to say the goodie bad was disappointing in comparison to other races I have done. It contained a Clif bar (I did not actually pick one of these up but I am sure it would be lovely), a bag of popcorn (which I also did not pickup because the flavours sounded terrible) and an ginger flavour energy drink (which tasted strange but also healthy). 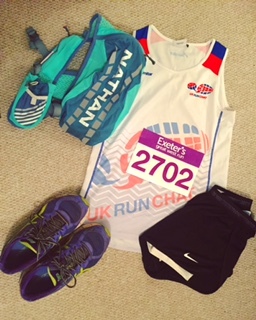 Will I run the Great West Run again? Yes I will, mainly because this race is on my doorstep but also because it gives you a challenge without being an absolute killer. I wouldn’t say a PB is always guaranteed because of the hills but it definitely provides an interesting route. 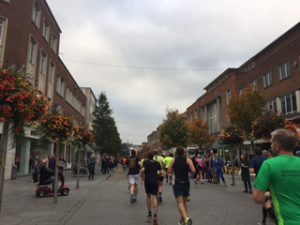 Exeter is a city with a small town vibe so if you are looking for a friendly place for your next race then it’s for you. If you ran the GWR last weekend let me know how you got on and what you thought of the race!